Whoa. This post is overdue this week! I`m terribly sorry for that. :( I`ve been trying to figure out graduate school/future career (aka huge-life-altering-decisions) stuff. Haha! It didn`t help that I couldn`t decide what to post! Originally, I planned to share my favorite chocolate chip cookie recipes. I know...there are so many already, but I want to share what my favorite recipes for the classic cookies are! Then, I decided to share this other cookie recipe...I had edited the photos and everything! Come today, I realized I made so many alterations to the recipes, I couldn`t remember which ones I liked the best to type out the recipe. Does that ever happen to you? I have so many notes and alterations to a recipe sometimes that they`re scribbled all on a tiny note. Oh no...I have to test one of my favorite cookie recipes yet, again? The horror. ;) Okay, horror for my love handles, but party for my taste buds! I decided, belatedly, to share this awesome ice cream recipe because it`s 91°F in Southern California today!! It`s so incredibly hot and windy out, I just want to swim in this ice cream. Looking at these pictures makes me want to lick my screen! The best part about this ice cream? It`s VEGAN. It`s dairy-free. Yep, creamy ice cream for those who are lactose intolerant and vegan. Best of every world! My sister became lactose intolerant a few years ago, so I thought I`ll make her ice cream she could eat. Since, I`m always eating it and talking about how amazing it tastes. The recipe comes from the amazing San Francisco Bi-Rite Creamery's Sweet Cream and Sugar Cones book. Being the huge foodie that I am, I knew I had to visit one of their locations. Lucky for me, this sister of mine goes to college in NorCal, so we had to opportunity to. My gosh, their ice cream is amazing. I just knew I would love their book. I made their chocolate coconut ice cream (and added some crushed Oreo cookies) and I was over the moon. I was ecstatic my sister loved it too! 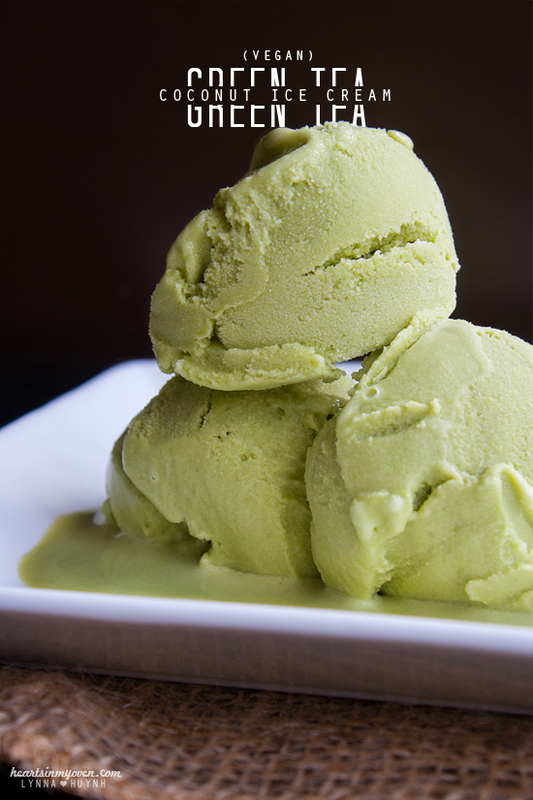 This green tea version satisfied my family`s love for green tea flavored desserts. It`s much easier to prepare compared to milk-based ice cream because you don`t have to make the custard over the stove. If you`re craving ice cream and don`t want to go through the hassle of separating eggs and making the custard for a frozen treat, definitely try this. 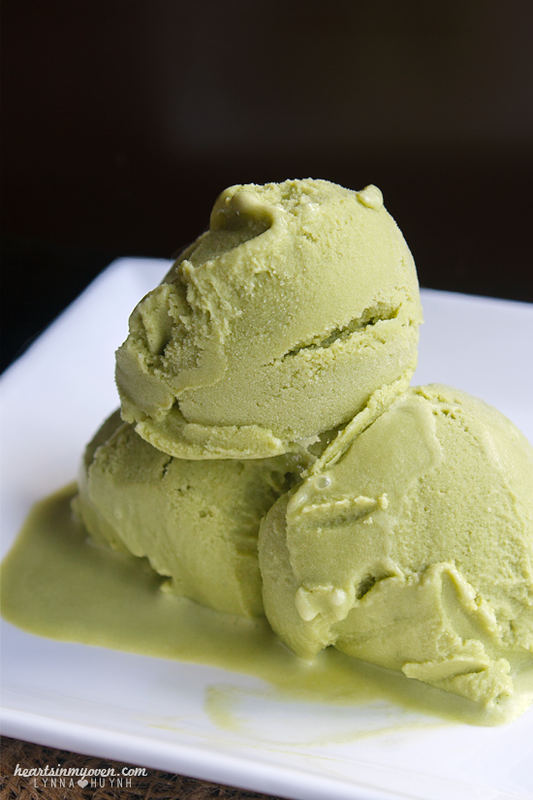 If you`re looking for a vegan/dairy-free ice cream recipe, you should definitely try this then. 1. If needed, freeze your ice cream bowl for at least 24 hours in advance to churning. 2. In a medium-large bowl, whisk together coconut milk, sugar, salt, vanilla, and corn syrup. 4. Cover bowl with plastic wrap touching the surface of cream mixture (to prevent a film from forming) and chill until mixture is completely cold (best overnight). 5. Right before churning, pour cream mixture through a fine mesh sieve into another bowl. 6. Churn ice cream mixture according to your manufacturer's instructions. 7. Scoop some ice cream into a freezer safe container and freeze until it reaches desired consistency. - There might be a lot of powder clumps still, don't worry about them. They'll go away after you strain the mixture before churning.